We’d like to go over a few things based on cocktail table arcade machines and help explain the differences between the various models. Cocktail table arcade machines refer to units that were low lying and rectangular in shape. Their design by nature looked just like a tabletop or coffee table so were a perfect height for users to place drinks on, hence the term ‘Cocktail Arcade Machine’ or ‘Table Arcade Machine’. 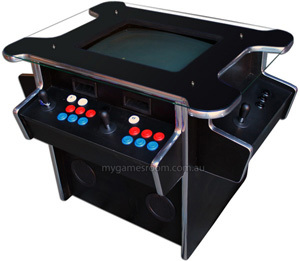 Arguably one of the best features of cocktail table arcade machines was the use of 2 opposing joysticks. Games at this age weren’t as advanced yet so simultaneous play was uncommon. The game was programmed to flip it’s screen 180 degrees depending on whose turn it was. This created fun interaction between 2 players as you could watch each other go through the stages. With today’s technology we’re able to provide the original look and feel of the classic games but offer so much more. 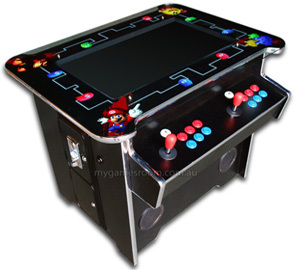 When purchasing an arcade machine it’s important to think about the space this machine will take up in your house. The way we see it, if you’re going to be investing the ‘real estate’ then why not have a machine that can do so much more. An example of one such machine is our 60 in 1 Cocktail Cabinet which is a replica of an original Pac-Man cabinet but features 60 games! All of your faves right there on one machine, to play as you choose. 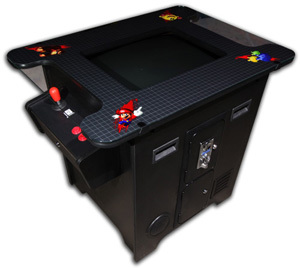 To take it one step further we also have our 1000 in 1 Cocktail Cabinet which as the name suggests, has over 1000 classic games! Everything from Space Invaders all the way to some 90’s classics like Street Fighter 2. So here we are, in the new millennium. We love the retro look and feel of tabletop gaming but we want options. Options like simultaneous play, and choice of games. The Cocktail Mark II (MKII) is here to solve the problem. By re-positioning the 2 controls so that they’re next to each other rather than opposite each other we’re able to convert an upright cabinet into a tabletop one. Still with over 1000 games you’ll be able to play all the games, with no limitations. The Cocktail Pro brings the best of both worlds to tabletop gaming. It features opposing controls just like the original, as well as the side by side controls of the MKII. The machine can recognise which games are to be played on which side so you’re not missing out on the gaming aspect and you’re not missing out on the retro feel. We hope you were able to gain a better understanding of the whole cocktail table top arcade world. We’ve got a few different designs of machines and there’s a reason for each of them. We hope that with this understanding you’ll have a better idea on which machine would be suitable for your household. For us though, it never ends and when we finish one project we open another. So where to from here? Well check out our new Ultra Edition Arcade Machine Platform to see where we’ve taken it!